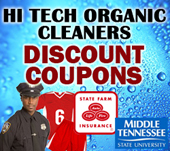 Hi Tech Organic Cleaners provides top-notch Wet cleaning services at competitive prices. We are proud of the fact that we pay special attention and detail to every article of clothing, giving you piece of mind and the best Wet cleaning experience. Wet Cleaning, Laundry, Alterations, Wash and Fold, Suits, Shirts, Pants, Skirts, Dresses, Household Draperies, Bed Spreads, Leather, Suede, Wedding Gowns And Much More!